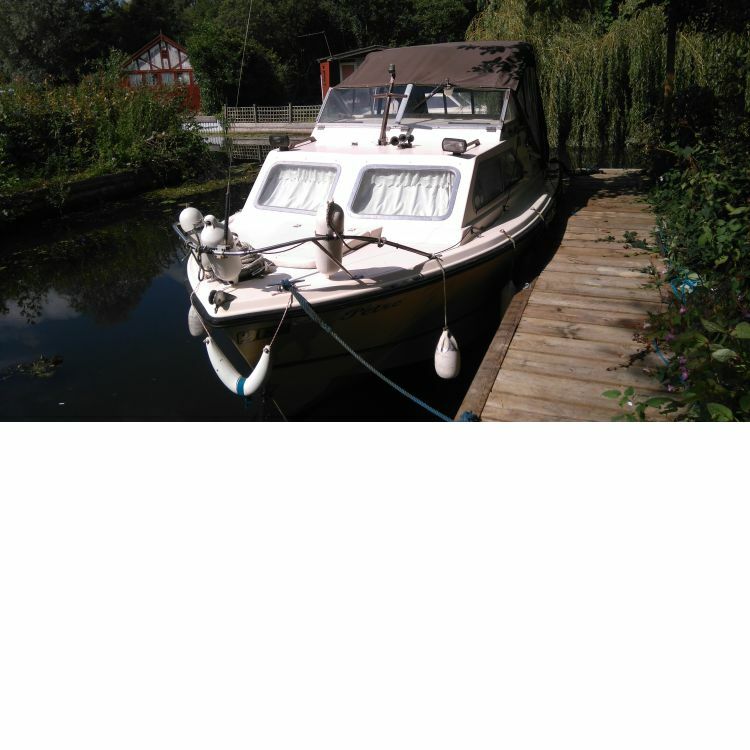 Description1: Shetland 640 4 berth cabin cruiser for sale with full pram top canopy and additional toneau cover. Full head height in cabin. Fully upholstered and carpeted cabin. Spacious cockpit comfortably seats boat for cruising all year round. •	BSS to 2020 •	Tolls Paid to April 2018 •	Length 6.4 metres (21ft) •	Beam 2.59 metres (8’6”) •	Original Gel Coat •	25hp Mariner Big Foot 4 stroke engine plus Hidea 4hp 4 stroke auxiliary engine •	26L Fuel Tank •	80L Water Tank •	12V Gel Batteries •	Helm Instruments – Fuel Gauge, Rev Counter & Battery Condition •	CB Radio •	Bilge Pumps & Float Switch •	Deck Equipment •	Fire Extinguishers & Blanket •	Nav Lights & Spotlights •	240V Sore Powers and consumer box with all round sockets •	12V LED Lighting to cabin and cockpit •	Lots of Lockers and Storage space •	Pump Out Toilet •	Water Heater providing hot water to mixer tap in galley sink •	Gas Hob, Oven & Grill •	240V Fridge •	Fixed Electric Heater in Cabin •	FM Car Radio/Cassette player Ready to go – so enjoy the rest of the summer cruising in this very comfortable boat. Located Horning, Norfolk Broads. Further enquiries or to arrange viewing call 07894 533234 or 07870 896182 Sensible offers around £7,500 considered for a quick sale.